This family runs on coffee! Our girl is getting her one year molars very slowly which means lots of wake ups and broken sleep. 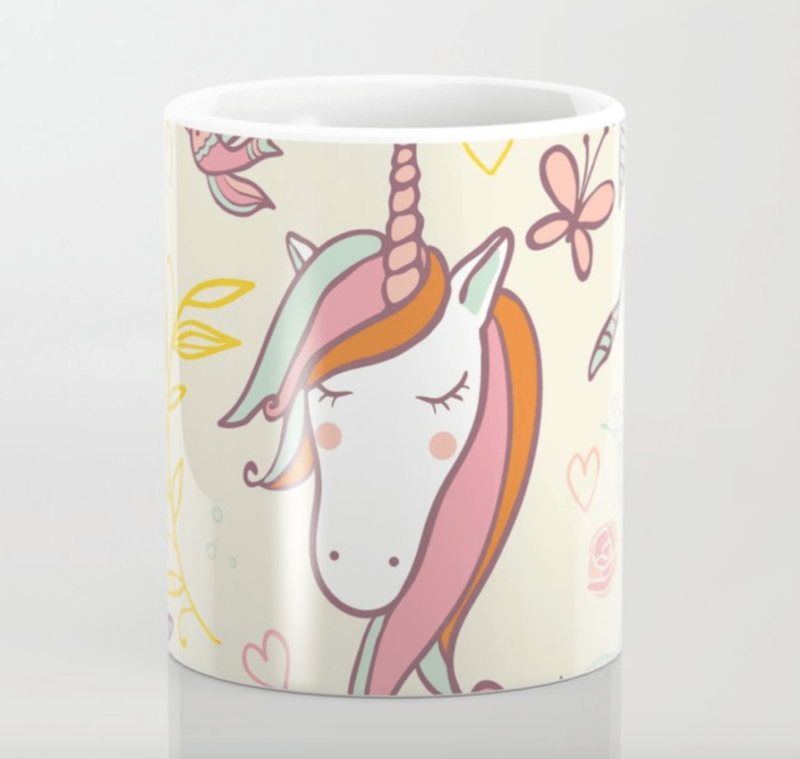 As a result, I have coffee mug gift ideas on my mind! Coffee mugs are like their own miniature gift basket. They’re so much fun to fill and to give! 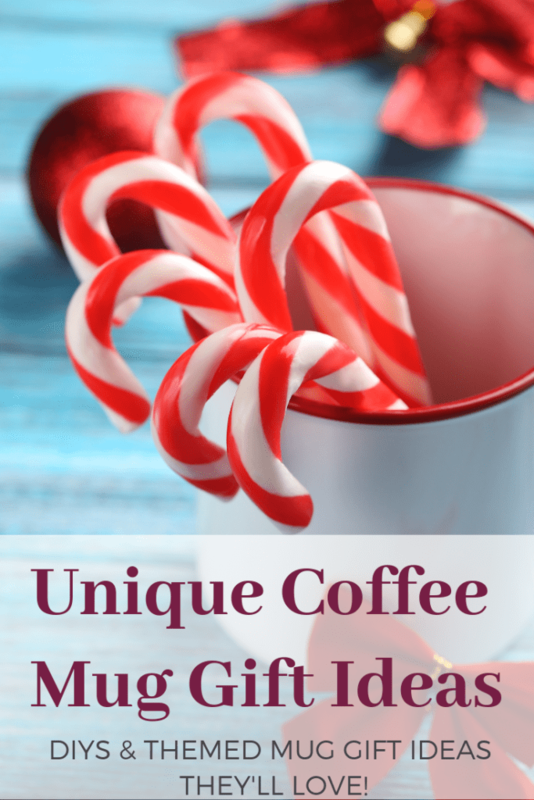 Today I’m sharing a variety of themed, unique coffee mug gift ideas. I hope you enjoy! A big part of a coffee mug gift is, of course, the mug! 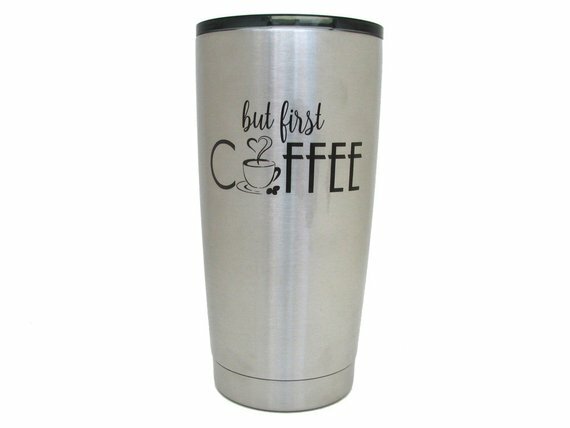 You can find a variety of unique coffee mugs online or decorate your own. 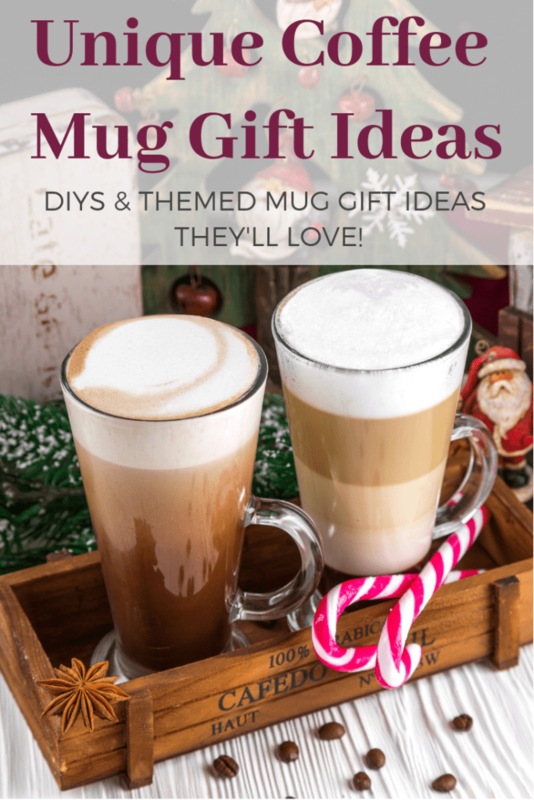 Picking a mug that matches the theme gift’s overall theme or that is especially appropriate for the recipient is an important part of putting together a great coffee mug gift! 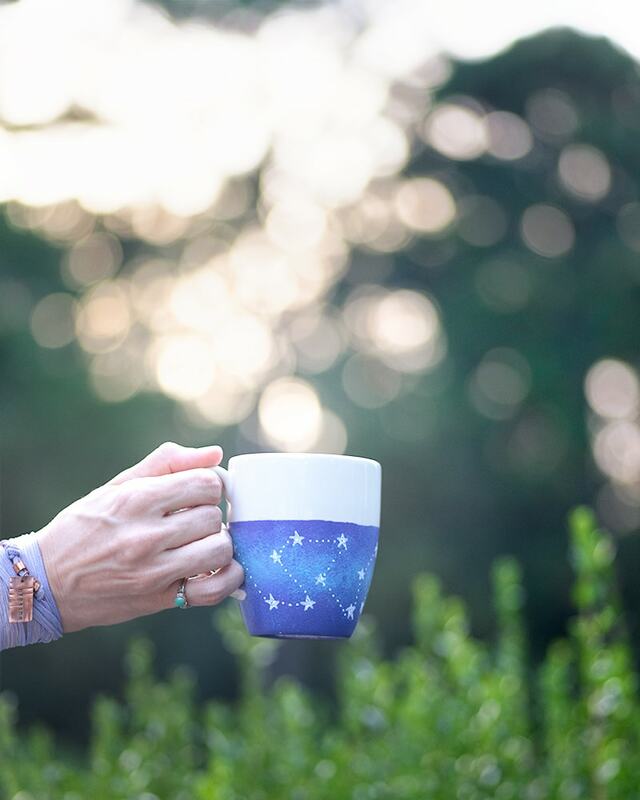 If you’re the crafty type and you know the recipient is into galaxies, take a look at this dishwasher safe galaxy mug tutorial. It shows you how to turn an inexpensive, plain white mug into an awesome piece of galaxy art! 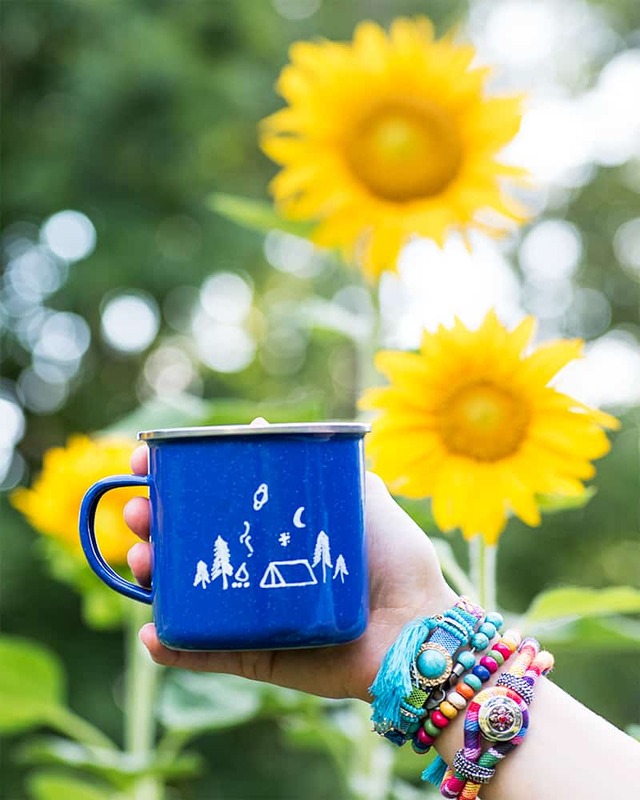 Or if your recipient is into adventuring, then this DIY camp mug may be more what you’re looking for! 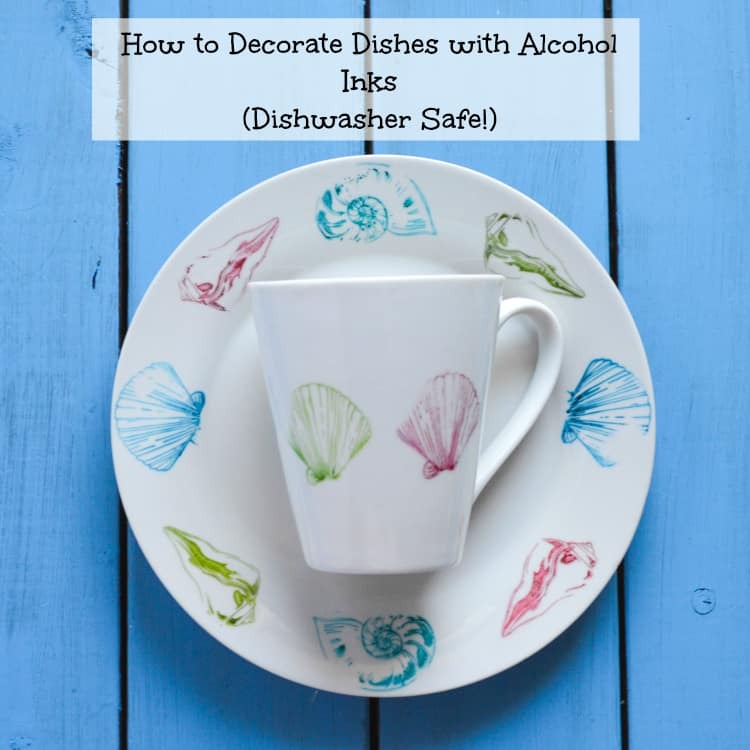 A few years ago I discovered you can create dishwasher safe decorated dishes with stamps and alcohol inks! You don’t even need to be able to draw or paint for these ones! I really love the marbled look people achieve with nail polish! 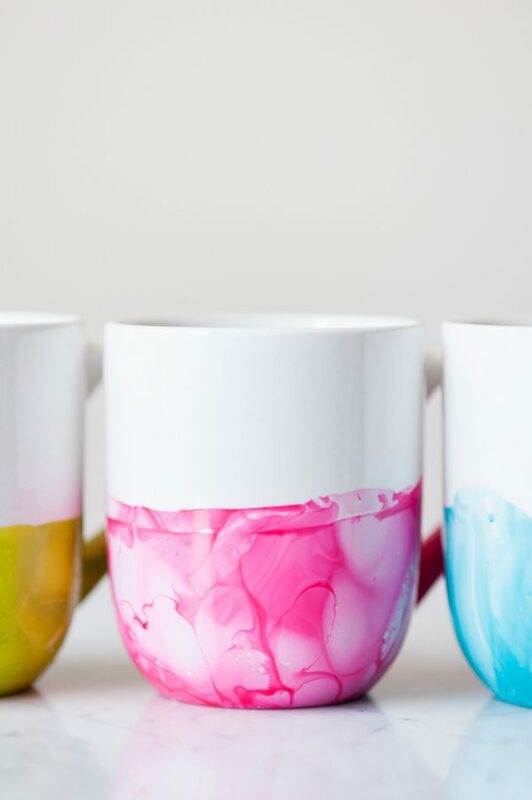 This post on marbled mugs from The Sweetest Occasion has loads of pictures to help you get the process right. Of course, there’s always Etsy! I love this coffee travel mug from Edi of Memories for Life. She’s an old Etsy teammate of mine and a really great person. Clay in Motion Handwarmer Mug - Purple Passion - Right Handed,14 oz. Alright, now let’s get to some unique themed coffee mug gift ideas! Bookmarks and tote bags are usually safe gifts for people who love reading and libraries! But there are other fun, useful things the bookworm in your life will enjoy, too. It sounds a little strange (and I’ll admit they look a bit goofy! ), but did you know there are prism glasses that let you read lying down without holding the book up over your head? Clip-on book lights have been so helpful to me over the years! They’re great for reading in bed, in the car, on planes, or anywhere else that’s just a bit too dark. There are a variety of book-themed scented candles, like this one called “Reading at the Cafe,” that sound delightful! As a photographer, I know I’d be thrilled to get one of those camera lens coffee mugs! Use a lens mug to hold fun things, like photography-related jewelry, or useful things, like spare memory cards. If you chose a memory card, getting something that writes quickly will make the photographer super happy! The SanDisk Extreme Pro line is the fastest card I own and it’s amazing. A lens/display cleaning kit is an affordable, useful gift for photographers that’s always useful! Extra batteries are a nice gift, too, as long as you know what camera they have! I’m not as familiar with Canon replacement batteries, but I know Nikon has two main sizes. There’s a smaller battery that works with most of the “prosumer” DSLRs, and a larger battery for the professional cameras. Because Adobe has announced a full suite of products for the iPad/iPhone (and has had some pretty good phone apps available for a while now!) a memory card reader for an iPhone is an affordable and useful gift for a photographer. Singers may have a reputation for being divas, but there are a few gifts they’re sure to use and love! Because they’re always rushing off to rehearsal, a travel mug can be a fun base for a mug gift for singers and musicians, alike. Singers, and other musicians, generally have to attend a lot of rehearsal. Rehearsals are frequently in the evening or at night which means that they’ll probably appreciate some actual coffee or gift cards to their favorite coffee shop! Singers rely on their voice. During a show or over a busy holiday weekend, they may rely on herbal teas like Throat Coat. There are also throat relief sprays for entertainers. By the same token, lubricating throat lozenges like Luden’s Wild Cherry throat drops can be absolutely essential to busy singers! Singer’s generally also appreciate scarves, cowls, and gaiters to protect their throats during colder months! Most artists love playing with new supplies and there are so many fun artist mugs available! One of my favorites is this “not paint water” mug on Society6. It would be so perfect for a painter! Mixed media artists, hand letters, calligraphers, and bullet journal-lovers usually love Tombow markers. Watercolor artists typically have their favorite colors and paints, but also tend to appreciate a smaller, travel-sized watercolor set for on the go. I’ve been very pleasantly surprised with the quality of the Prima watercolor sets and have started bringing one with me almost every time I travel! Sakura Micron pens are quite popular with many types of visual artist, and so are large grip pencils! I recently saw a coffee mug gift idea for knitters that said to put a ball of yarn and pair of needles in a mug. That sounds like a nice idea, but if someone is a serious knitter or crocheter they’re not particularly likely to actually ever use that ball of yarn unless it’s something particularly unique or that they specifically need for a project! Yarn can make a good gift for knitters and crocheters, if you know what they’re interested in or looking for. I bought yarn for my husband for Christmas last year because I knew he wanted to make a particular hat, for example. There are a zillion cute yarn-related mugs, or you could put your “coffee mug” gifts in a yarn bowl! Stitch markers! There are locking stitch markers for crochet and knitting crochet stitch markers. They’re one of those useful little things you can never have enough of! (You can also use locking stitch markers for knitting, just in case you’re wondering.) There are also plenty of cute stitch markers with charms, like these with sheep. Fiber artists also tend to enjoy project bags that keep projects organized and easy to grab on the go! Darning needles for yarn are needed for just about every single knitting and crochet project. They’re another one of those things you can never have enough of! There are so many amazing adventure mugs that would make the perfect foundation for a coffee mug gift for the adventurer, hiker, or wanderer in your life. Anyone who spends time outside needs sunscreen! Going with a fragrance free, oil free option like the Beyond Costal Active line is a great choice. You can never have too many flashlights! Small, but powerful, flashlights and headlamps are sure to be a hit with adventure lovers. It might seem cliché, but hikers and campers really appreciate a good pair of socks! I received several pairs of Smartwool socks for Christmas years ago and I’m still using them regularly! The Lifestraw personal water filter is another neat, unique gift idea for outdoors-enthusiasts. I’ve personally owned a couple and have found them quite useful! There are so many smaller, stocking stuffer-type gifts for cyclist that would fit perfectly in a mug! A rechargeable bike light is a great way to help keep your favorite cyclist safe. I used to commute to/from work on a bike and I almost always ran my lights, even during the day, to increase visibility. A lightweight reflective safety vest can also really improve visibility. Cycling gloves are another useful choice, especially in colder weather! A windproof neck gaiter is great for cyclists and runners. I told my mom about this post and she started volunteering gift ideas for gardeners! I wasn’t planning to include gardeners, but I really liked her suggestions. Many gardeners today really appreciate heirloom seeds. Her favorite place to shop heirloom seeds is Southern Exposure. Seed Savers Exchange is another good place to look for fruits, vegetables, and flowers. If you garden with heirloom seeds, you can always package and gift some of your own seeds! Plant labels/gardening markers are always useful! According to my family, you can never have too many pairs of gardening gloves. Gardners also appreciate hydrating hand cream, especially if they neglected to wear gloves. My husband and I love Badger Balm products! DIY coffee mug gifts are great when you need to make teacher gifts, presents for folks at the office, or if you’re on a budget. One popular idea is the “snowman soup” theme. 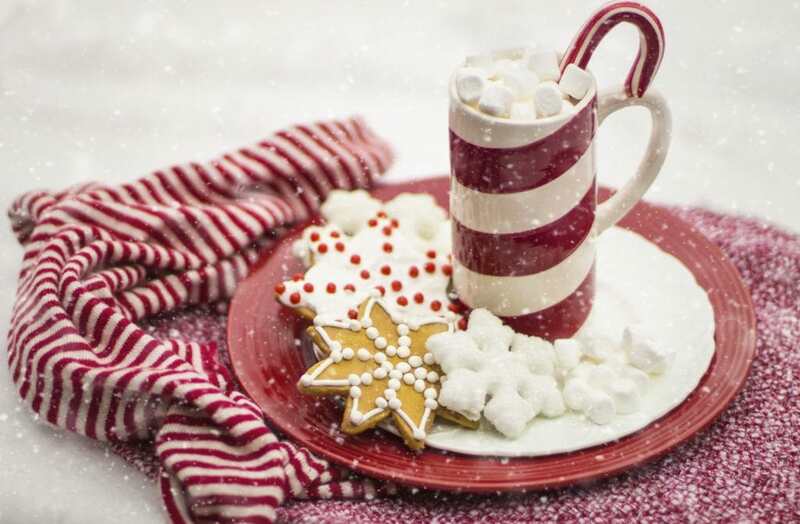 Take a mug, pop in a packet or two of hot chocolate mix, a bag of mini marshmallows, and a candy cane or two. Yum! You can make a hot drink sampler mug. Add packets of flavored hot chocolate mixes, instant coffees (especially premium ones like Starbucks Via), and even instant tea mixes. This works particularly well for teacher gifts and office parties because you can buy a couple boxes of mixes and then parcel them out! The treat yourself kit. Roll up a pair of fuzzy socks and add a few pieces of chocolate and other goodies like nail polish, lip balm, or a bath bomb. Planters. Mugs make super cute planters for low-maintenance plants like succulents! A mug cake kit is another great option for a last-minute mug gift! 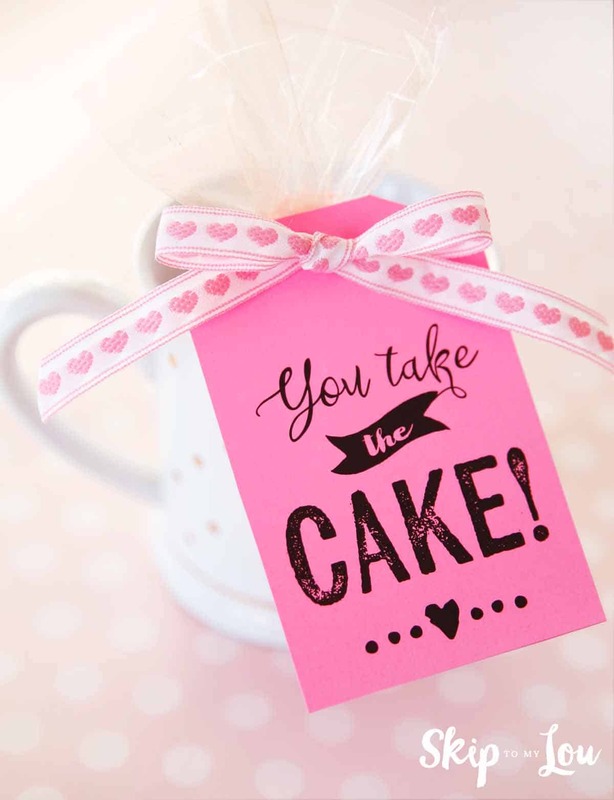 Skip to my Lou has a mug cake gift recipe with cute free printables! I really hope you’ve enjoyed this guide to unique coffee mug gift ideas! I’ll be adding more unique, useful ideas to the post in the future and would love to hear your suggestions if you have any! All look creative and quite easy to do. Nothing’s better for a gift than a handmade.